Swinging in the Clouds and Galloping Geese! Wednesday morning in Ridgway, CO greeted Bonnie and me with cloudy skies and a forecast for rain. Though we didn’t pay much attention to it, wind, rain and lightning buffeted the environs the evening and night before. “Nobody told us,” Bonnie bemoaned, “that this is the monsoon season!” Yes, that’s exactly what the TV weatherman called Colorado July weather. Before leaving town, we headed over to the local railroad museum. There we photographed an exact replica of Galloping Goose #1; whereas railroads of yesteryear referred to them generically as “motors,” the Rio Grande Southern nicknamed those odd trains (cross between a boxcar and a truck) in their fleet the Galloping Geese. 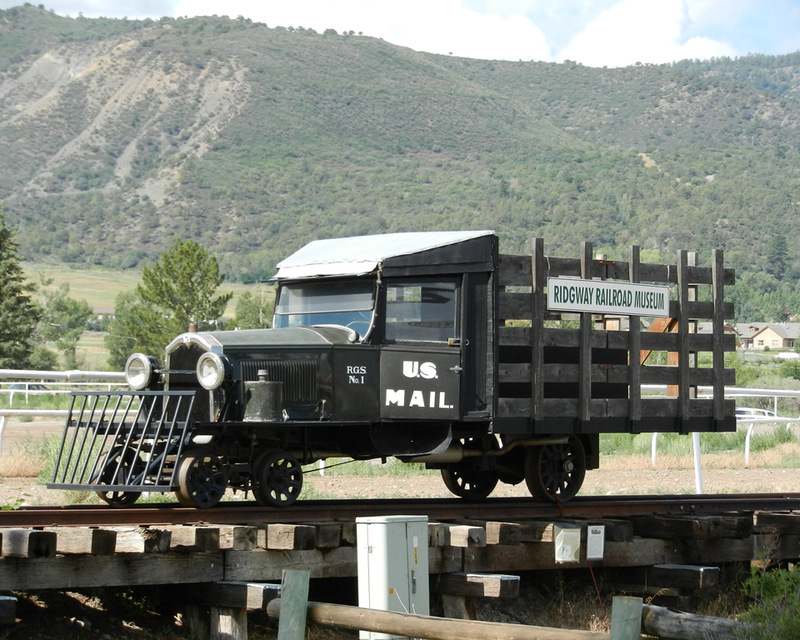 This particular one was a small pickup truck that rode the rails delivering mail. 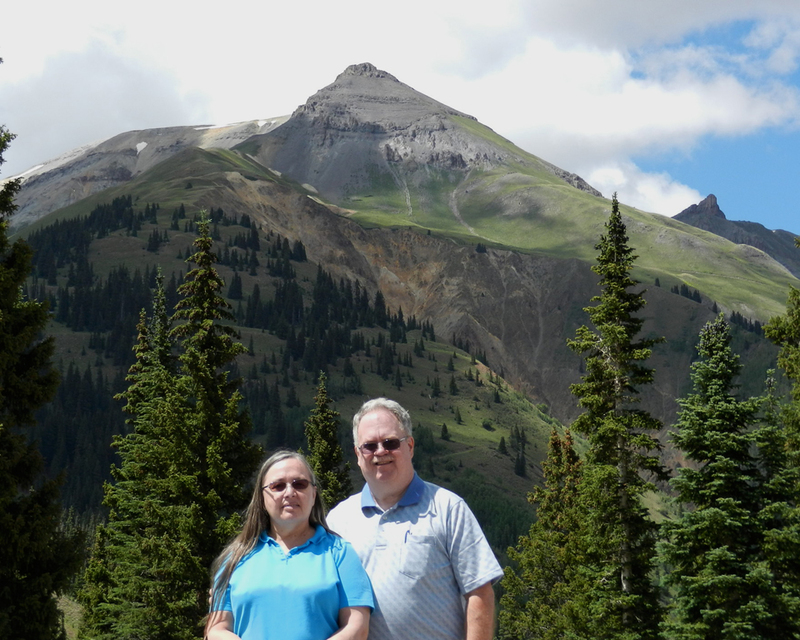 After refueling the rental car, we drove toward Telluride, CO. A long time before we encountered difficulties, a lighted road sign warned that the road ahead was closed. It seemed as if a sick joke, but the wording on the sign advised to take an alternative route, but there are no alternative routes! We were on the only paved highway and the only roadway that didn’t require four-wheel drive going the direction we needed to go. Eventually, we encountered the huge mudslide that had closed Colorado Highway 145 north of Telluride until 1 a.m. We experienced a delay, but we were able to pass through; the slick, red mudslide must have enveloped miles of roadway. Not long after getting past the mudslide, we arrived at Mountain Village. 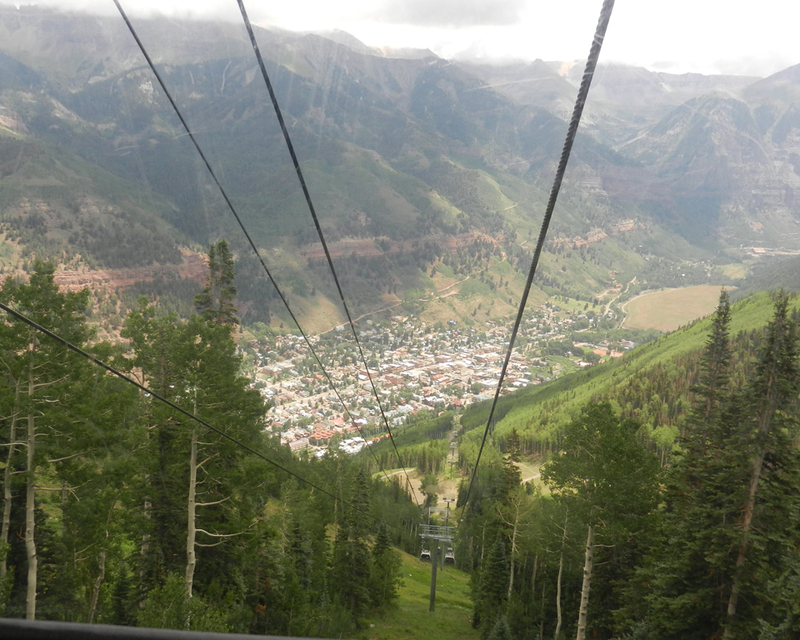 At first, we could not find suitable parking; we paid $7 to an unmanned, cantankerous machine sentry to park so we could ride the free gondola from Mountain Village across hilltops and valleys and down a mountain into downtown Telluride. The parking fee was well worth just the experience on the series of gondolas in to town. After all, it is not every day that we get to swing through the clouds and skip on mountain tops aboard a cable-bound, swinging gondola. 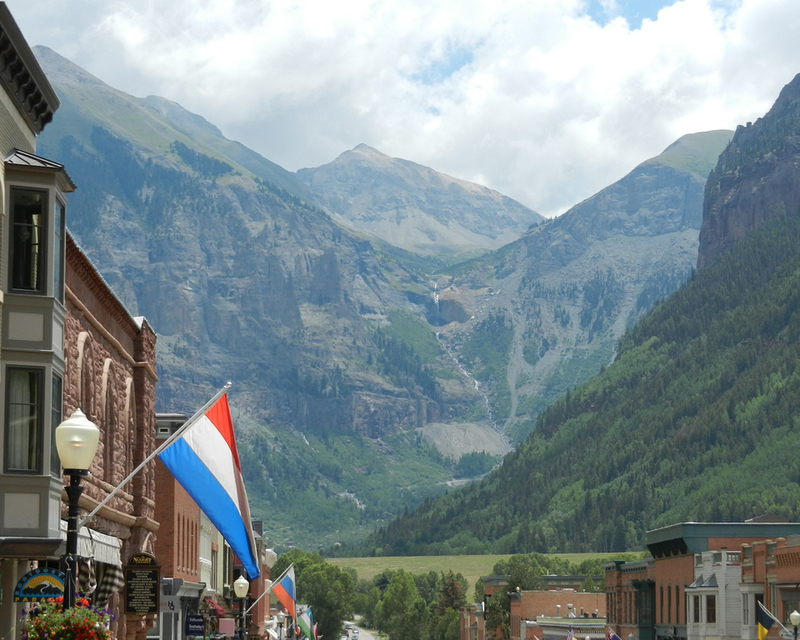 Apparently, we visited after most summer visitors had come and gone; all of the visitor maps and guides had vanished before we arrived, and we were left to wander according to our best guess to find the main thoroughfare of shops in Telluride. The entire town is consumed with real estate sales, expensive clothing stores and pricey restaurants (not necessarily fancy, just expensive). 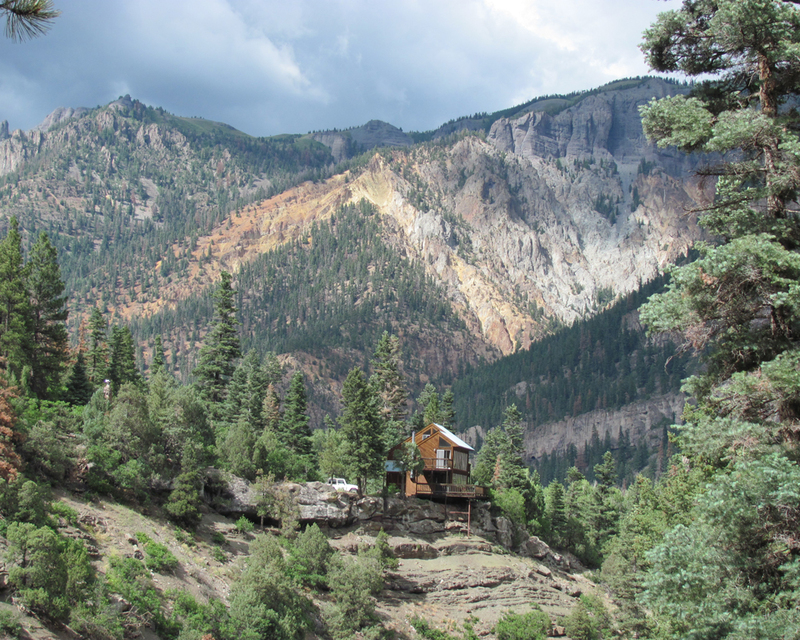 The historic mining town of bygone days was invisible amidst the joggers, hikers, bikers and the well-off clientele of the mountain golf course and sea of condominiums. It was not at all what we had imagined, and it held little interest for us – except for Galloping Goose #4, which was on display along the main street. It was wedged angle-wise between two buildings, shrouded with short trees and with a picnic table in use at its side. Unfortunately, we were not able to get a picture of it in its entirety under those circumstances. 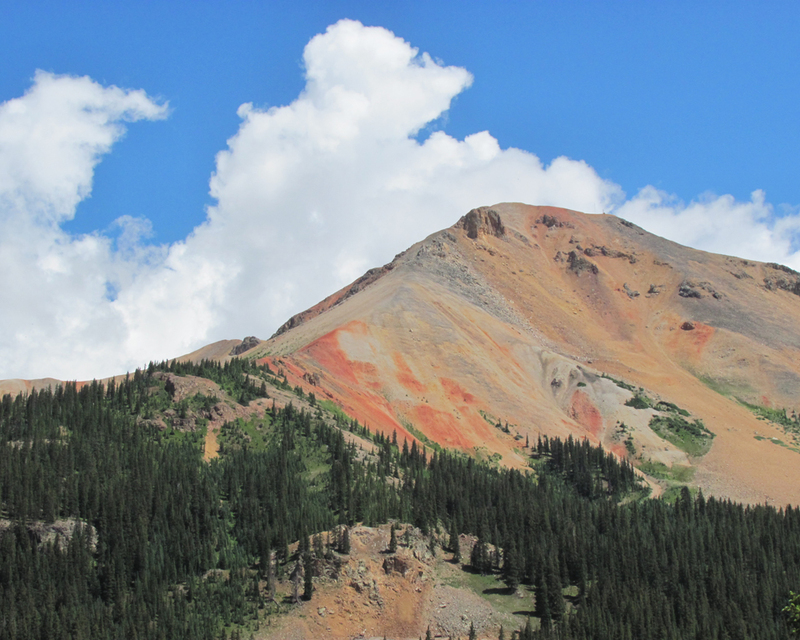 The second highest waterfalls in Colorado is somewhere around the town of Telluride. However, no map or guide book in hand, and with no signage, besides being on foot, we counseled ourselves that we were tired anyway and headed back toward the gondolas. The balance of the drive toward Cortez was uneventful compared to the harrowing ride across the top of the mountains the day before. For me personally, the brightest moment of the day was when we happened upon along our route of travel Galloping Goose #5. There it was beside the highway in Delores, CO in front of the old train depot – now a little museum. This specimen is carted by tractor-trailer various times of the year to special events where it once more takes on passengers and plies the rails. I must confess that I bought a souvenir! It was time to continue our day’s journey southward toward Cortez. Do you know how hard it is to find a restaurant with which you are not familiar in a part of the country with which you are not familiar – when it has changed its name! I drove in so many circles in all directions turning around and looking every which way. It’s a wonder that someone didn’t call the authorities to investigate. Finally, we found the place, but the name didn’t match the advertising, and subsequently, the menu was different, too. Nevertheless, we had a good meal before returning to our motel for the night (two nights in total, actually). We are tired. Since we applied sunscreen to our faces and arms (we burned slightly yesterday), and we seemed to have experienced a dusty day, we feel like we have been breaded. To clean up and to slumber we must, for another day comes, we think. If it does not come, either because the earth no longer turns or though it does we do not, that will be all right, too. Each of us must ready ourselves to meet God in Judgment (Amos 4:12). Comments: Comments Off on Swinging in the Clouds and Galloping Geese! 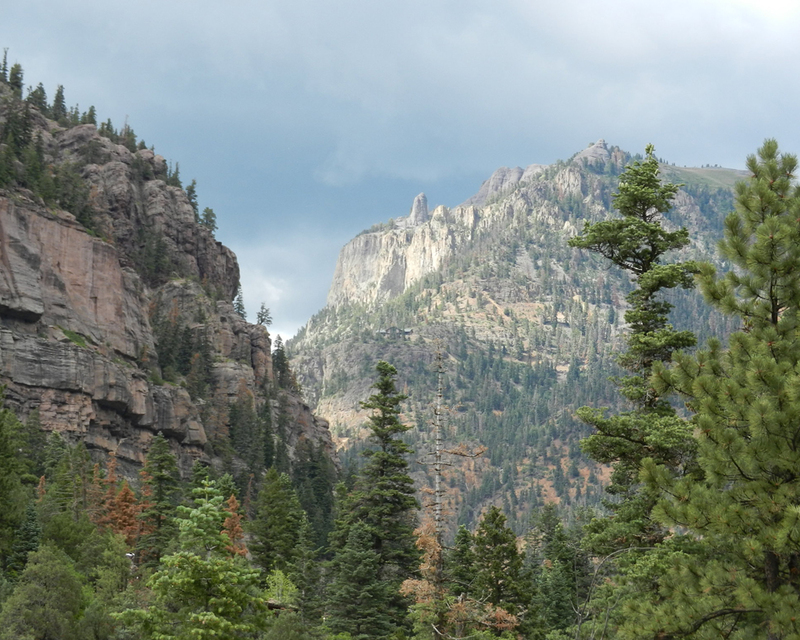 Tuesday morning as we drove through Durango northward, we observed that gasoline prices had jumped ten cents overnight, except for one station on the other side of the road. Since it was inconvenient to turn around, I proceeded north; that was a mistake as all other gasoline spied later in the day retailed from $3.84 to nearly $4.00 a gallon. Initially, we feared that we would be able to see little and unable to take any pictures due to the overcast skies and low-hanging clouds. The first several pull offs to which we came were wasted on us because of poor visibility. Furthermore, the farther we drove the higher we climbed until we were literally driving in the clouds – in excess of 10,000 feet. Having visited Silverton the day before via steam train, today we traveled by small rental car. We ate at the Black Bear Café and afterward strolled through some shops. 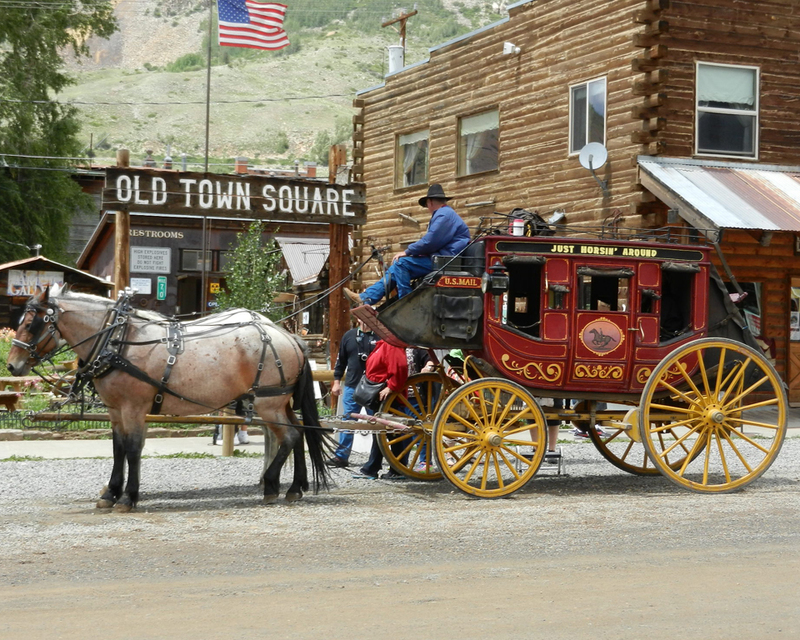 To our delight, we were able to capture a working, old west stagecoach on our digital camera. Between periods of rain, the skies cleared considerably so that we were able to pull over from time to time (sometimes the pull offs were within sight of each other) and get some nice photographs. We visited two waterfalls, both of which were spectacular. Often, the roadway extended to the very guardrail-absent edge of a cliff dropping a thousand or more feet – punctuated with such sharp curves sometimes that the GPS directed us to turn right or left (the GPS didn’t know if we were coming or going!). 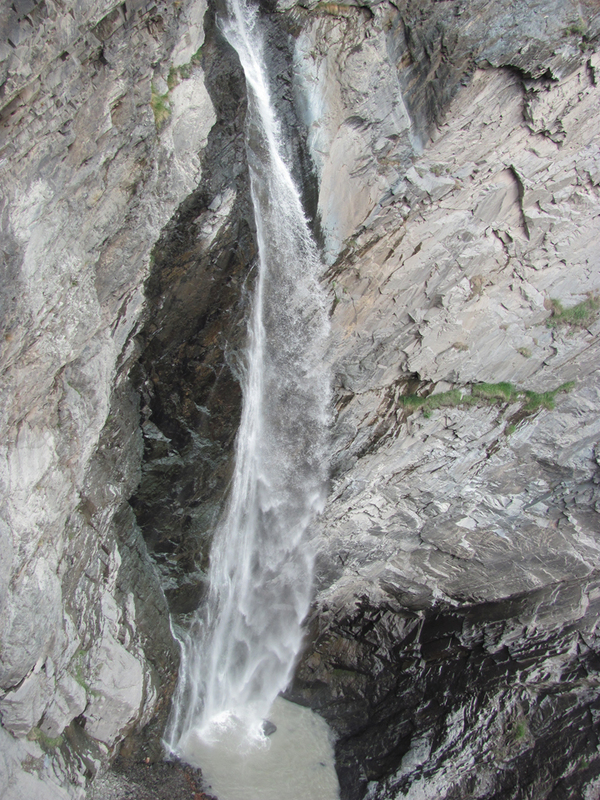 The second falls was in Ouray, CO, through which we passed on the way to our lodging in Ridgeway, CO. We found supper at the True Grit Café (several sites in and around Ridgeway were backdrops for the John Wayne movie True Grit). 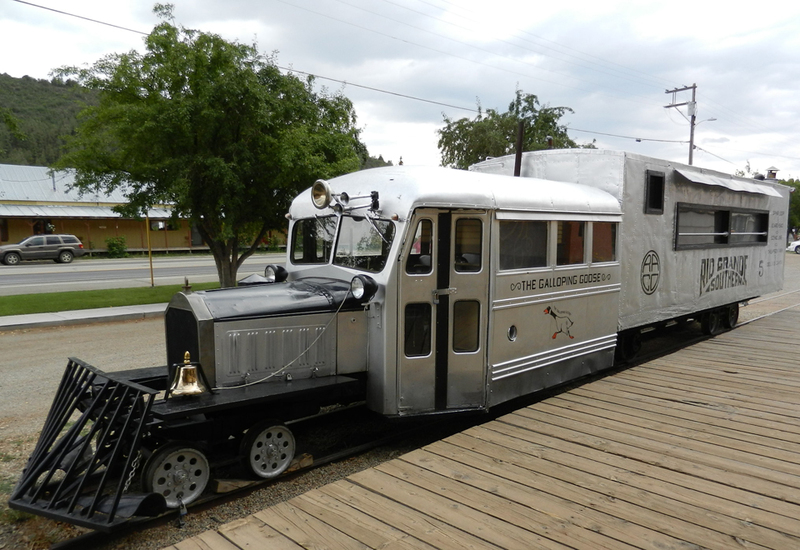 The town of Ridgeway was once the home of the Rio Grande Southern Railroad, and there is a small museum dedicated to it that I hope to visit tomorrow. 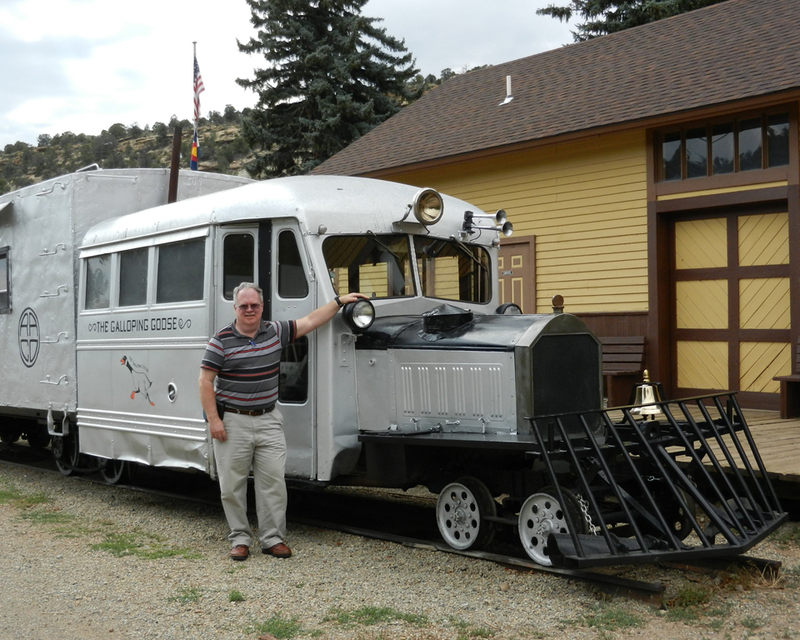 Its pride and joy, the Galloping Goose, though, has been removed to Telluride, CO, where we expect to be sometime tomorrow. If you don’t know about the Galloping Geese, look them up; you may find them as interesting as do I. My best friend (Bonnie) and I, Lord willing, will make a huge circle over the next few days this week through and around the mountains in southwest Colorado. The handiwork of Almighty God is everywhere sounding forth the existence of our Great Creator (Romans 1:20). 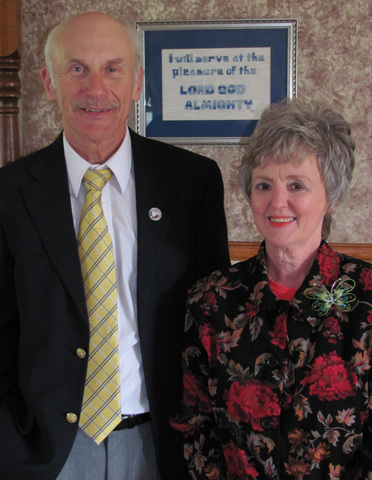 Tuesday evening, June 12, Bonnie and I arrived back in Winona, MS from our nearly two weeks of mission work in Guyana, South America. We taught five workshops in various parts of the country, visited patients in a hospital, participated in home Bible studies, taught youth in a boarding school, attended a marriage seminar and worshipped with two congregations. In the workshops, Bonnie taught Christian women about The Role of Women in the Home and in the Church. I taught Male Leadership in the Home and the Church. Sessions were conducted in Georgetown, Linden, New Amsterdam and outside of Charity. Sometimes lively panel discussions concluded each appointment, where a capable Guyanese brother and I fielded questions on the workshop theme and other Bible questions. We were in Guyana during the rainy season. It rained off and on every day! The combination of heat and high humidity made for sticky days. Bugs aplenty made their presence known, with ant, mosquito and spider bites populating our skin with pock marks from time to time literally from head to toe. Of all the places we travel in the world, Guyanese mosquitos cause the greatest, swiftest and longest lasting effects on me personally. One dark, early morning I felt the bite on my forehead, and immediately I began to swell in the affected area. The bulging bump stretched my skin until that hurt, too. The larger bridges we crossed were all floating on barges. These toll bridges were approximately a mile in length, and they bobbed up and down as voluminous traffic traversed them. The most interesting mode of transportation was a speed boat we rode each way across the mouth of the Essequibo River at the Atlantic Ocean. The boat held about 18 passengers and cargo. It was open topped and traveled around 60 mph crossway to the current and around islands. The water was calm in the morning, and the ride was smooth but we could barely open our eyes for the force of the wind. The return trip across the river that afternoon was bumpy, comparable I would imagine to riding a mechanical bull. We do not have to buy excitement at an amusement park! Passengers hold up across the benches what resembles the upholstery off of a couch when anticipating a blast of water shooting up over the bow or pushed by the wind over the side. Sometimes we deflected the water, and sometimes our timing was imperfect. Even when we managed to avoid being smacked in the face with a wave of water, still the water fell into the boat and soaked us. It was virtually impossible to open one’s eyes due to the force of the wind. Forty-five minutes of bouncing on the waves with the boat battering our kidneys and bladders, sodden with saltwater baths, arms aching from using them as masts to steady the furniture fabric sail meant to protect us, we arrived on the opposite shore. This trip involved a two-day drive, boat ride and taxi ride to our destination near Charity. We went attired in dress shirt and pants with tie in place to be ready for the workshop upon our arrival. We could only laugh to ourselves and know that we could not adequately describe this affair to anyone back home. By the way, one Guyanese brother told us the life preservers were required – to locate bodies easier! Another Guyanese brother pointed out the plastic jugs strapped to the underside of the benches – so the boat wouldn’t sink when it overturns! There is a lot of ongoing interest in Guyana by American Christians who devote themselves to the employment of various methodologies for evangelism in that country. Perhaps some missionaries edify congregations that they encounter. However, we are not aware of any widespread investment by American Christians to help mature the Lord’s church in Guyana. That is why beginning in 2012 Bonnie and I are devoting ourselves to working with church leaders on a national level to help grow the church from the inside out. We want to contribute to the stability and maturity of the congregations throughout the country – in the more easily accessible areas as well as in the bush as the nationals say. Our primary partner in Guyana is Nigel Milo. He is a graduate of Heritage Christian University in Florence, AL, and he was mentored by Edmond Cagle. Nigel is academically qualified, experienced in the USA and his homeland of Guyana, and he is fully devoted to the cause of Christ. Through him, Bonnie and I will continue to work with Guyanese preaching brethren and their congregations throughout the entire nation of Guyana. We are already planning an extended mobile program for 2013 that will take us to most areas of Guyana. Whatever good comes of these humble investments of ourselves will we pledge to the glory to God and earnestly desire to be a blessing to our Guyanese brethren. Comments: Comments Off on We’re Back! Early Tuesday morning, Winsome, Bonnie and I arose and boarded a taxi for the hour drive back to the airport serving Mandalay. From there, it was a short trip by airplane, up over and into the mountains toward Inle Lake. It must be a rule some place that generally airports have to be an hour away from the communities that they serve, so once more, we were in a taxi for a long ride. This time, the scenery with its winding roads and descents reminded us of being back in West Virginia. We even passed a cloverleaf of railroad track and bridge scaling the mountainside. Eventually, we arrived in our hotel, a quaint place sporting duplex bungalows. Advertised as having air conditioning, we were disappointed to find out that the units didn’t actually do much anymore other than decorate the walls and give the pretense of added value. Lodging was adequate, and at night at the altitude where we were an open, screened window plus a pedestal fan running and aimed at the bed, we were comfortable. Bonnie and I had thought that our two-month trip abroad to Asia would be a perfect opportunity to eat less or more responsibly, do a little more walking, and possibly loose a little weight. Our thinking was that since often we do not like some of the strange foods very much, we can discipline ourselves and promote better health. What did we find in the town in which we were lodging, just two short blocks from our bungalow but a Burmese operated Italian restaurant – with the best Italian food that we have ever experienced anywhere. Throw out the diet! We ate pizzas, homemade noodles and meat sauce (with actual meat in it, unlike many places in America) and gnocchi pasta. They have two restaurants in two villages, and we ate at both of them. The food is not prepared until the order is placed, and one can watch the food preparation. The pizzas are baked in a wood-fired oven. Everything pleased our pallets! Our destination was to intercept a parade of boats, roped together, which towed three huge pagoda boats of monks and offerings of food and flowers around part of the perimeter of the lake, taking the Buddha images from one pagoda to another. These villages are on top of the lake! The streets are waterways. We had arrived at the Burmese version of Venice. Here babies learn to swim before they learn to crawl. Small children paddle themselves around the villages in dugout canoes. 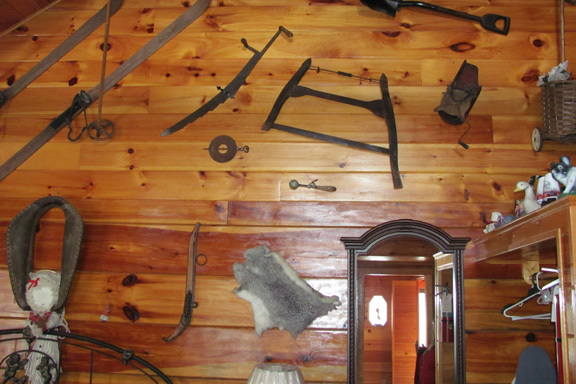 …we traveled to a blacksmith shop and watched the men pound metal into a small scythe. The blacksmith shop is located in a building on the water. We also visited a weaving shop complete with spinning thread from the Lotus plant. Since it is a festival day only a few workers were present, and we did not get to see all aspects of work. We stopped by the boat building site to discover that there was too much water in the workshop, and they could not show us how they build their boats. We did see them making cigars by hand. The fogged crested mountains, overshadowed by dense clouds in the morning commute were replaced by end of day with dark storm clouds and heavy rain. Traveling back toward our lodging, the sun and rain mix created the largest and brightest rainbow that we have ever seen anywhere. The colors were not pale, but vivid and distinctly bright. In between the coming to Inle Lake and the leaving of it, the intense Burmese sun scorched my exposed flesh and the wind on the lake whipped my features, despite wearing a ball cap. Eventually days later, my face and especially my nose peeled off. Inle Lake was an excursion, not a teaching opportunity. We need to punctuate our trips abroad with tourist activities on occasion, at least to validate the tourist visas on which we travel. It does not hurt to experience some recreation, too, from time to time. However, the trip to Inle Lake was also a marvelous opportunity to educate ourselves more fully on Burmese culture and thinking. Among the activities to which Winsome took us was a puppet show, in what to you and me would be the attached garage of someone’s dwelling. Throughout the country – and many countries – grand things occur on a small scale, which require an adjustment of expectations and an appreciation of humble things. One of the unique characteristics of these mountain lake villagers is that little ones and adults paddle their canoes while standing and rowing with their legs. The fishermen have a singularly different way of fishing, too, with nets stretched over bamboo, inverted trumpet-like cages, by which they trap a disturbance in the lake mud and spear the intended prey with a three pronged spear. Among the remarkable oddities were the girls and women from one tribe that sport brass rings on their necks, adding more rings year by year until they carry several pounds. Thursday, we made the hour trek back to the airport, up the mountainous, winding roads past tremendous views. Our next destination was Yangon. Some sights are staggeringly beautiful. Often those are the making of postcards and tourism pitches. 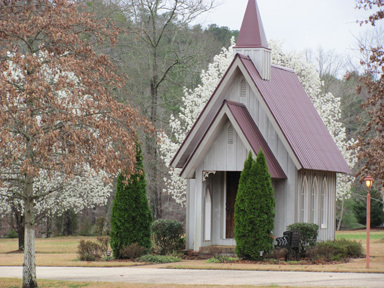 This miniature church building on private property in Double Springs, Alabama, with the flowering trees showcasing it, is postcard perfect, don’t you agree. It has miniature benches inside, too. 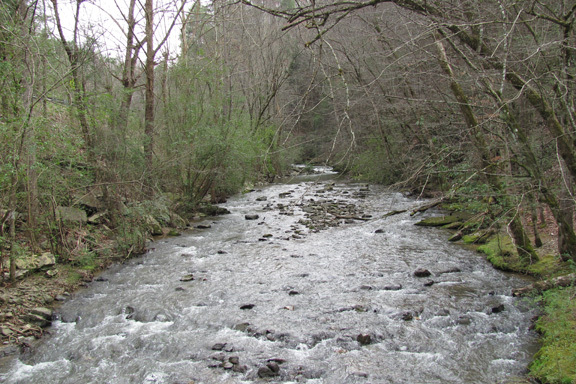 It is a perfect location, for instance, to have a youth devotional. Comments: Comments Off on Postcard Perfect!